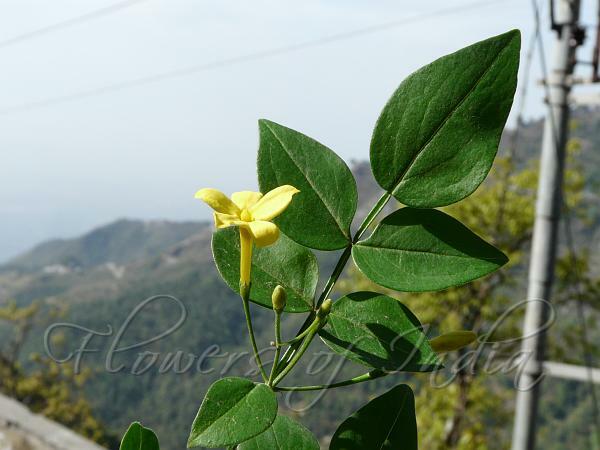 Yellow Jasmine is a small erect much-branched shrub, growing to 1 m or more tall, commonly found in the Himalayan region. It has green, angular branches. Leaves are pinnate with 3-7 ovate to lancelike leathery leaflets. The last leaflet is somewhat larger. Inflorescences are lax clusters of yellow tubular flowers at the end of branches. Flowers have a slender tube, 1-2 cm long, with 5 rounded spreading petals, about 6 mm. Sepal tube is cup shaped, only 3 mm in size, with tiny triangular sepals. Fruit is black berry, 8 mm in size, with crimson juice. 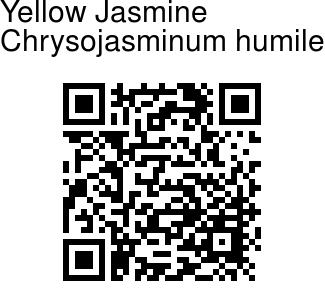 Yellow Jasmine is found in the Himalayas, from Afghanistan to NE India and China, at altitudes of 1800-4000 m. Flowering: April-June. Medicinal uses: The flowers are astringent and a tonic for the heart and bowels. A paste made frm the flowers is considered effective in the treatment of intestinal problems. The juice of the root is used in the treatment of ringworm. The milky juice of the plant is used for destroying the unhealthy lining walls of chronic sinuses and fistulas.